Semiconductor physics, quantum electronics and optoelectronics, 21 (1), P. 5-40 (2018). Semiconductor physics, quantum electronics and optoelectronics, 21 (1), P. 41-47 (2018). Semiconductor physics, quantum electronics and optoelectronics, 21 (1), P. 48-53 (2018). Semiconductor physics, quantum electronics and optoelectronics, 21 (1), P. 54-57 (2018). Semiconductor physics, quantum electronics and optoelectronics, 21 (1), P. 58-64 (2018). Semiconductor physics, quantum electronics and optoelectronics, 21 (1), P. 65-72 (2018). Semiconductor physics, quantum electronics and optoelectronics, 21 (1), P. 73-79 (2018). Semiconductor physics, quantum electronics and optoelectronics, 21 (1), P. 80-82 (2018). Semiconductor physics, quantum electronics and optoelectronics, 21 (1), P. 83-88 (2018). Semiconductor physics, quantum electronics and optoelectronics, 21 (1), P. 89-94 (2018). 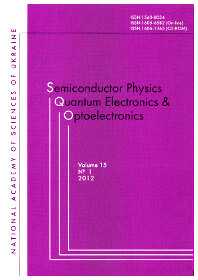 Semiconductor physics, quantum electronics and optoelectronics, 21 (1), P. 95-99 (2018). Semiconductor physics, quantum electronics and optoelectronics, 21 (1), P. 100-101 (2018). Semiconductor physics, quantum electronics and optoelectronics, 21 (1), P. 102-104 (2018). Semiconductor physics, quantum electronics and optoelectronics, 21 (1), P. 105 (2018).